Possibly one of the biggest event coming to Crocodile Rock this summer, the inaugural “The All Star Tour” is making it’s way towards Allentown next week. So who’s going to be playing and why should you care? 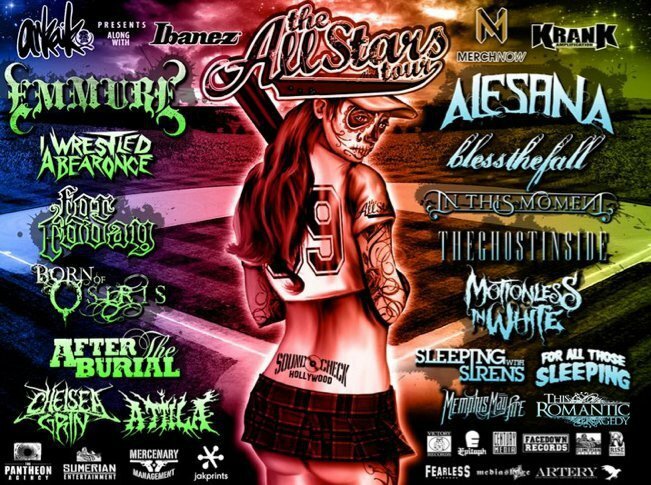 Well, let’s see… Emmure, Alesana, For Today, blessthefall, iwrestledabearonce, In This Moment, Born of Osiris, The Ghost Inside, Scranton’s Motionless In White, After The Burial, Sleeping With Sirens, Chelsea Grin, For All Those Sleeping, Memphis May Fire, and opening up will be Allentown’s very own As Cities Fall will all be there. Trust me, you DO NOT want to miss this! Tickets are selling-out fast as this show was originally scheduled to be at the Soveign Center in Reading.